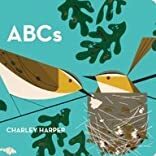 Charley Harper ABCs was written by Charley Harper. Charley Harper ABCs was published by Ammo Books. 1/6/2010 William Emerich said: The example of simplified form, flat color, and inventive arrangement of expressive marks continues to be fresh and surprising.